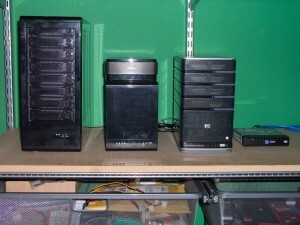 One of the great community topics we’ve had going in the forums for quite a while is the “Show Off Your Server” topic, where members share pictures of their home servers, networking closets, and home theater setups. In the past couple of weeks we have had two forum members sharing their MediaSmart Servers and the massive amounts of storage they have available in their homes. First, forum member “cavediver” showed us his 17 hard drive, 21 terabyte MediaSmart Server (from which I borrowed a screenshot for the April Fools Day article, thanks cavediver!). cavediver is using a Sans Digital TR4M 4-drive external eSATA enclosure, a Sans Digital TR8U 8-drive external USB enclosure, and an Antec Veris fan cooled USB external enclosure for WHS BDBB backups. Shortly after we heard from another forum member named “courtois” who in total has 4 HP MediaSmart Server’s totaling 32TB in the Storage pool and 19TB external storage. 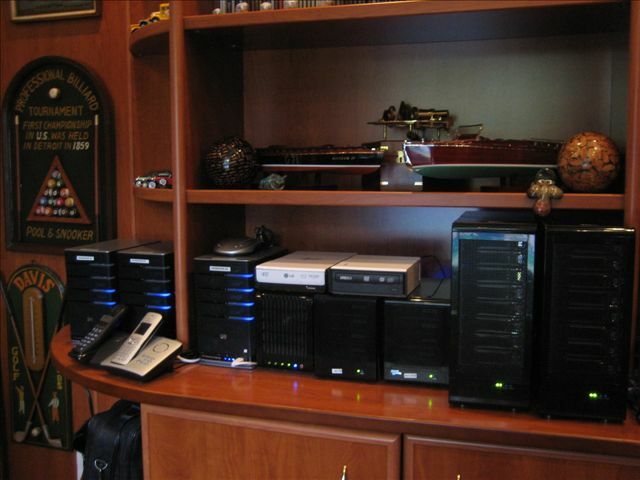 His primary server is a 24 hard drive, 28 terabyte MediaSmart Server that has 8 more drives and 12 more terabytes of storage on the way. It should be noted that courtois is having some issues getting those last drives added to the server, however we’re currently suspecting that the USB subsystem of the MediaSmart server is being overloaded rather than an issue with Windows Home Server. Be sure to sign up to the forums for more pictures and to find out if courtois is able to get to 32 drives (the limit of drives able to be connected to a Windows Home Server) and a mind blowing 40 terabytes of storage. 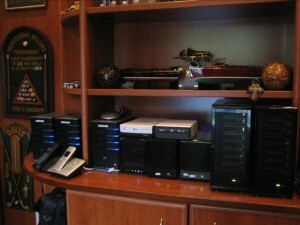 And if you do sign up, be sure to stop by the “Show Off Your Server” topic and share pictures of your setup. Alex, Whatever your reasons for leaving HP, I am glad you remained loyal to the product. We are all the beneficiaries of this.